Now the vocalist and song writer of Japanese band GaGaaling, MYM wasn't familiar with music until she went to a Rolling Stones' concert. She was impressed with the live event so much she then decided to be a vocalist. In December 2005, she met an artist named Rikki who is physically challenged, and she learned a lot of things through this experience. Also, she had published a book called "Tsuyoi Namida" (Strong Tears) which are stories on why she started GaGaaling. Besides GaGaaling, she is working as a fashion model too. 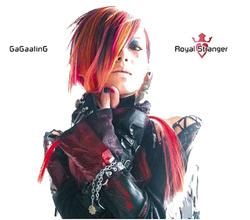 GaGaaling was formed in 2004 with three members, MYM, MOTO, and CHERRY. In 2005, they debuted with the CD Royal Punx from label ROYAL PUNX in 2005. Adding bassist JUN in 2007, the band released ROYAL BLOOD.